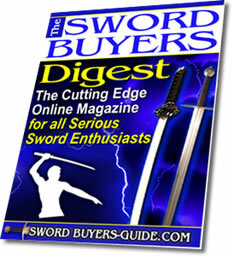 In our sub US$300 price range, there aren't really any Celtic swords that come close to being historically accurate. Generation 2's take on Celtic Swords is very much the same as just about every other manufacturer in our price range - a leaf shaped blade and a simple "stick-man" hilt, with legs forming the hand guard and head and raised arms creating the pommel. 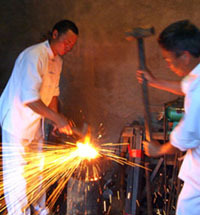 The basic design is inspired at least in part by the original Celtic "La Tene" sword, pictured left. Obviously though, the resemblance is fleeting to say the least, and isn't at all even close to being historically accurate. "In many ways, these contemporary Celtic swords are rather 'space age' in appearance..."
No doubt, he would assume it to be the result of some strange Druidic magic. Historical/Archeological accuracy aside, these Celtic swords do have a somewhat 'Gallic' presence to them. The hilt is very simple, but really quite attractive. The 'head, arms and legs' are all solid brass. And the handle looks at first like a block of black/dark brown plastic, but is actually macassar ivory wood with finger ridges along its length. 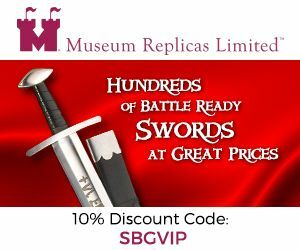 Unlike other versions of these Celtic swords, the handle is quite thick and covers a much beefier and more durable tang that is securely peened and pounded flat through the top of this swords 'head'. 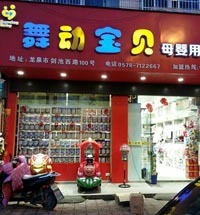 Everything is very tightly assembled, and with such a simple, practical design there is very little that can go wrong. My only criticism is that the handle is a little too thick and difficult to grip as it's design would dictate. So to get the best grip, I am forced to hold it a little closer towards the hand guard, though this is a minor criticism and I'd much prefer this than the weedy tang and handle construction seen on other versions made by different companies. I should also briefly here mention the scabbard. 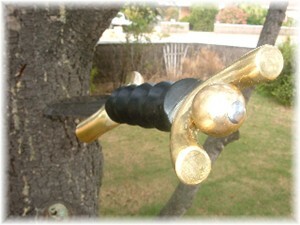 While it is definitely not historical (after all, the scabbards of Celtic swords were traditionally highly decorated with Celtic motifs and the like) the simple leather scabbard actually suits this sword very well - the lip of which is finished seamlessly to fit in the circular gap between it's brass 'legs'. The leaf shaped blade itself is really quite attractive, with a better level of polish than I've seen on most Generation 2 swords. The fuller is somewhat extraneous (after all, Celtic swords NEVER actually had fullers), but does help to lighten the blade a little. I can only guess that the fuller was not planned in the original design of this particular sword, because with an overall weight of 3lbs, this sword is very heavy for a sword of this size. In fact, weight wise it is comparable to a historical hand and a half sword! 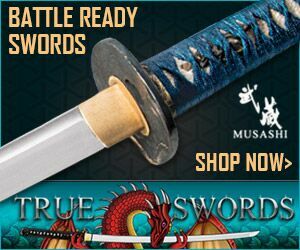 The point of balance on this sword is 4" from the cross guard, which when combined with this swords extra weight gives it some serious momentum when swung. Just holding it aloft vertically gives a sense that it is already priming itself to swing. Recovery time suffers greatly as a result, but I've found that by gripping the 'head and legs' of the pommel with my off hand, this sword is a lot more manageable when used in a hand and a half manner. "...they would raise their swords aloft and smite after the manner of wild boars, throwing the whole weight of their bodies into the blow like hewers of wood or men digging with mattocks, and again they would deliver crosswise blows aimed at no target, as if they intended to cut to pieces the entire bodies of their adversaries, protective armor and all..."
As such, this sword would suit them down to a tee! 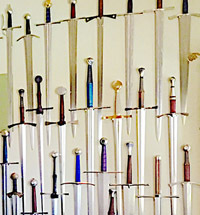 Because as we'll see from the following tests, these Celtic swords are not only very, very sharp but also extremely durable and perfectly suitable for a wild Celtic fighting spirit! Against light targets such as water filled plastic bottles, the Generation 2 Celtic Anthropomorphic Sword just sails on through. The blades perfect cutting profile and sharp edge means that such targets are basically effortless, as can clearly be demonstrated by the clip below. As I've come to rely on with Generation 2 swords, these beaters really shine when up against ridiculously heavy targets. 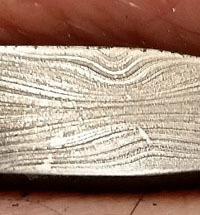 There's no doubt that continued, daily abuse of this nature would over time create severe metal fatigue. It's just basic physics. But to tell you the truth (as you can see by the state of the tree in the picture below!) this sword has a hell of a lot of life left in it even after these tests had been repeated several times...! 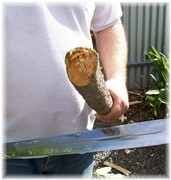 The end result was one severed tree limb, but the Celtic swords blade was undamaged. Naturally, there was a little cosmetic marring of the shiny mirrored polish - but nothing that a quick polish by hand could not buff out. The edge itself was still as keen as ever! 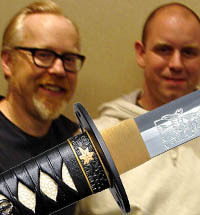 "At the end of the day, this really is one hell of a tough, MEAN little sword!!!" 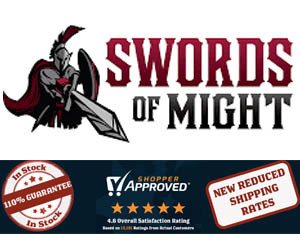 Highly recommended as a great all around beater, especially for the price, this sword really is a lot of fun to mess around with. 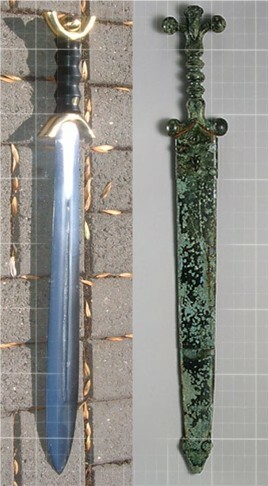 Pictured left is an image taken from Richard F. Burton's book, The Book of the Sword circa 1884, which depicts a "Keltic Short Sword" that is in the Vienna Cabinet of Antiquities that very closely matches the design chosen by Gen2 and others. So it would seem that, while it still isn't exactly like this design either, there were historical Celtic swords that were really quite similar! 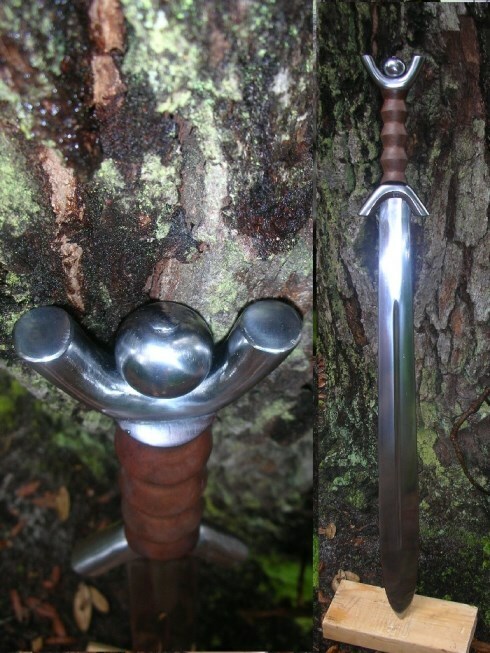 (Unless of course, someone travelled back in time and gave that Celtic chieftan one of these Gen 2 Celtic swords! Lol). Finally, the product itself is slightly changed - the cost of the solid brass fittings became prohibitive and it now uses all steel. Which makes it even TOUGHER and I don't really feel it loses too much in the way of looks. Availability is an issue with this one, it has not been in stock very often since 2010.. 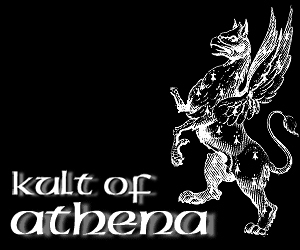 However, on the occasions that it does come back into stock, Kult of Athena stock them HERE for a very reasonable $229.99.. I hope this information on Generation 2's Celtic Swords has been helpful. 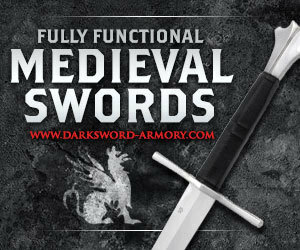 To return to Modern Replicas of Ancient Swords from Contemporary Celtic Swords, click here.